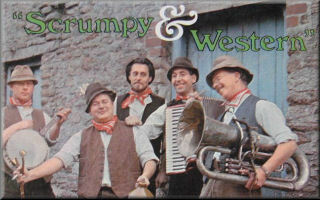 Scrumpy & Western website. Made In Somerset from cider! 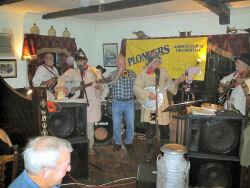 The Plonkers Agricultural Orchestra band page. 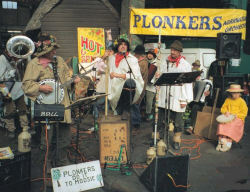 The original Plonkers Agricultural Orchestra started life in 1979 when Gordon and Bob entered the Lymington Carnival with a cider-making machine 'float'. It was a two-wheeled cart pulled by Plonker The Donkey with whistles, bells and various gizmos. The cart was followed by Gordon on banjo, Bob on squeeze box and a trombone and bass drum. They won first prize playing the chorus of Drink Up Thy Zider (which is all they knew, but as they kept moving the crowd never realised this!) for the whole parade. They did this for a few years until the 'band' numbered fiftenn. Then one year the band booked for the Lymington Steam Fair couldn't make it and Gordon was asked to stand in - the first booking for The Plonker's Agricultural Orchestra. They have been plaguing the New Forest ever since...although Plonker The Donkey has passed away. 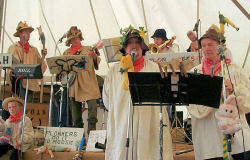 The Plonkers have released two album 'recorded in full Plonkerphonic farmyard sound'. A third album is being worked on as you read this.